Prairie du Chien Open Gym is Canceled for April 13th & 20th! Click HERE to log in to manage your account, register for classes & events! New to TNT Gymnastics? Go to the "Location" tab above and go to your desired location to view class schedule. Click "ENROLL" next to the class you would like and you can begin setting up new account! Team Students - go to the "Team" page. Classes will be held at 940 County Rd. E, Livingston, WI 53554 (Formerly Livingston Twisters). To view more information & to register for classes (Registration opens April 1st) - Click HERE! Events Coming Soon - Register Now! 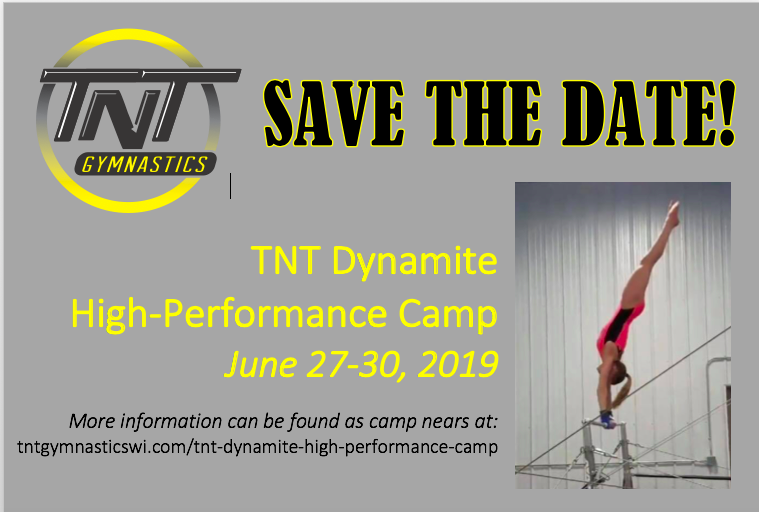 Dynamite High Performance Camp (June 27-30) - Click HERE for more information. 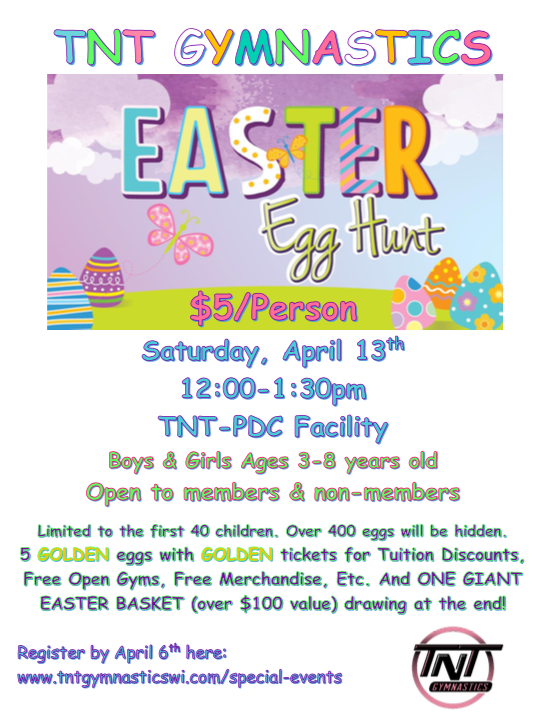 Easter Egg Hunt - April 13 @ PDC Gym - Click HERE for more information. ONLY 3 SPOTS LEFT! TNT will attempt to make up the first 2 cancellations of each session. All cancellations after that will be missed without refund/make-up due to scheduling limitations. Notifications for weather-related cancellations will be announced on our Facebook page and via e-mail. We try to make these calls by Noon (12pm) at the latest to give everyone plenty of notice. You can also call the voicemail of (608) 279 - 9913. Fall session begins Sept 8th! If paying monthly - please see calendar for the monthly tuition dates. 4 weeks are not necessarily in the same month - they may run into the next month some. The months of March, May, September & December are prorated 25% off due to only having 3 weeks. Monthly payments are due the 1st of each month - if payment is not received by the 7th of the month a $5 late fee will be added to your account. Download "2019 TNT YEARLY CALENDAR.pdf"
Prairie du Chien has truly been the home of TNT Gymnastics’ Cinderella story. The program started at the community roller rink 18 years ago and, during that time, it has utilized several cramped, sometimes unsuitable, gym spaces. 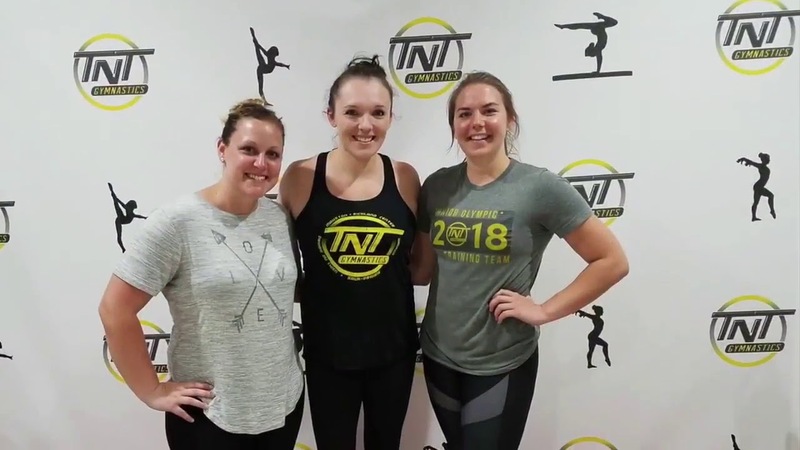 TNT Gymnastics will break ground on an ultra-modern new facility on La Pointe Street, behind the Windsor Place, in mid-October, and expects the gym to be open by the first of the year. There will be a grand opening in the spring. Getting to this point has very much been a rags to riches tale. Tracy (Steldt) Troxel started TNT in an old karate studio in Boscobel 19 years ago. The following year, she expanded, adding locations in Prairie du Chien and Richland Center. Once her two additional programs began growing, and not having a place to call home in Boscobel anymore, Tracy decided to end offerings there. She opened gyms in Spring Green, Mauston and, last year, Waukon, Iowa. Her employees have grown from one to now 12, including three full-time. “We started with the rec program, then turned to amateur and now we’re in the professional league of USA Gymnastics,” Tracy said proudly. Tracy moved from the Milwaukee area to Blue River with her family at the age of 10. Her parents enrolled her in a Wauzeka-based program, run by Karla Zinkle: KZ Tumblers. As she grew older, Tracy began training and competing through Livingston Twisters, an organization run by John Mullarney. “He taught me how to be professional, about education and how to be a high-level gymnast. He took me all the way to nationals,” she noted. By that time, Tracy had become a level 9 gymnast, qualifying to nationals in California in 2002. She then moved on to MadTown Twisters, where she finished her competitive career at the highest USAG Junior Olympic level as a level 10 gymnast. Tracy recalled telling her teacher, in the fifth grade, that she wanted to become a gymnastics coach when she “grew up.” Now, she’s actually living those aspirations, loving it and can hardly believe her destiny. She’s not only the business owner but also the head coach at the Richland Center location. She lives in Gays Mills. Tracy’s gym manager at TNT Gymnastics, Danielle Mueller, is also the head coach for the Prairie du Chien and Mauston programs, and the recreational and team coach in Richland Center. She reached level 9 status under Tracy’s coaching and qualified for the western championships in Oklahoma in 2009. She holds a degree in health education. Kristen Brooks is the third full-time coach. She leads Prairie du Chien’s competition team and is head coach at the Waukon, Iowa, gym. “We have had a lot of really good success of raising the gymnasts and then they become our coaches,” Tracy commented. The junior assistant program, as it’s called, brings in a few of the older team members to help with classes, build their leadership skills and show them how to become instructors. In Prairie du Chien, total membership has grown from 20 kids in the beginning to over 200 students, as TNT’s highest-enrolled program. Recreational and club athletes come from a 45-mile radius to train in Prairie du Chien. Tracy believes TNT’s positive development is a testament to its coaching. Tracy described the many relocations TNT has had in 18 years in Prairie du Chien. After the roller rink closed, they were welcomed into Bluff View School, but soon the school needed the space, so the program moved to the Hoffman Hall basement. Later, they used the high school wrestling room, went back to Bluff View, then to MPC and, currently, they’re settled at a warehouse near Prairie Cinema. In recent months, Tracy began realizing the warehouse, which is rented to other entities too, simply wasn’t working out well for TNT. When faced with the decision to either move to another inadequate space or to bravely invest in her success by building anew, she chose the latter. Additionally, TNT has an outstanding partnership with the school district in Prairie du Chien, she added, saying the two “feed off of each other” and are happy to see the other flourish. For example, the high school coach is an employee of TNT. The junior high and high school gymnasts, as well as wrestlers and track competitors, have benefitted from TNT’s facility, equipment and even its coaching expertise. The school district has certain equipment TNT makes use of regularly. And, Tracy and Danielle have volunteered to spot for and originate routines for the high school gymnastics team occasionally. In nearly two decades locally, the program has helped train some of Prairie du Chien’s most well-known gymnasts prior to high school, including Colleen Jones, Jamie Feye, Brittany Sheckler, Madeline Peterson, and now Kylee O’Kane and Mackenzie Pettit. Tracy noted that wrestlers today are finding that a backbend arch is a good way to escape a wrestling hold. Plus, pole vaulters and high jumpers are learning greater flexibility in order to strengthen their performances. While TNT’s new facility has been a thrilling announcement, the business is also purchasing the latest, state-of-the-art equipment for its new home. Though gymnastics is TNT’s bread and butter, Tracy said her other programs are doing well, too. In all, she offers recreational and competitive team gymnastics, wrestling-focused flexibility and tumbling, ninja course training, acrobatics classes for dancers, open gym, private lessons, adult classes, cheer and tumble classes, toddler classes, themed tumbling and even birthday parties. Children age 2.5 through teen can join the program and are welcome at any ability level. The fun is not just for girls and you don’t have to be a member to enjoy TNT. She pointed out that, this past summer, she saw an average of 40 boys at the Prairie du Chien site. “This new facility will be a place where kids can come and get away from the (TV and computer) screen or use the equipment during the winter,” Tracy said, noting that she’d like to see home school and day care groups and families come enjoy the trampoline, ninja warrior course and “paint and tumble” opportunities. Moving into the future, she envisions continuing TNT’s enthusiastic environment and enriching experiences for young people. She loves to empower participants and provide them lifelong benefits through their accomplishments. TNT Gymnastics was opened in 1999 by Tracy (Steldt) Troxel in a Karate Studio in Boscobel, WI. Tracy then expanded adding a location in Prairie du Chien, WI & Richland Center, WI. Eventually closing the Boscobel location to focus on growing the Richland Center and Prairie du Chien locations. Tracy was a USAG level 10 gymnast as well as a level 10 national qualifier. Tracy is married to her high school sweetheart Jesse Troxel and they have three children--Jade, Jesse Jr. & Jaxon. Currently, TNT consists of five locations: Richland Center, Prairie du Chien, Sauk Prairie, Waukon & Mauston. We also do pop-up seasonal programs in Spring Green & Lancaster during winter/summer! TNT Gymnastics is an enthusiastic environment with a passionate coaching staff committed to giving to, enhancing and enriching young lives through the sport of gymnastics. TNT is dedicated to helping all gymnasts reach their potential, both physically and mentally, by offering every child the best gymnastics instruction possible. Most importantly, TNT is a place where all participants can feel great about their accomplishments while seeking life-long benefits from their gymnastics experience. Copyright ©2019 TNT Gymnastics. All Rights Reserved.